Welcome to the first week of Comic Book Herald’s ‘My Marvelous Year.’ Below you’ll find our reading selections for the year of 1962, and at the end of our reading, you’ll find my thoughts on the year and our winners for hero and villain of the year. Vote Here For Your Hero & Villain Of The Year! Voting closes on Thursday at 6 p.m. every week. New list and year every Friday! First of all, thanks to everyone for taking part in My Marvelous Year. The turnout has been excellent and we have way more votes than I could have expected for hero and villain of the year. 1) It’s easy to forget this now, with three poor to atrocious movies in the rearview, but the Fantastic Four were the biggest Marvel attraction by far. It’s not just that they begin the Marvel year as we know it, it’s that everything Marvel runs through the Fantastic Four throughout the 60’s. The Fantastic Four are Apple’s Macintosh computer, or MacDonald’s big Mac. Heck, the Human Torch had a side gig in Strange Tales before the likes of Iron Man, Avengers, or Dr. Strange even made an appearance! 2) In their first year as a creative duo, Stan Lee (or as he will heretofore be named, Stanly the Manly) and Jack Kirby (heretofore: The King, aka King Kirby) created the Fantastic Four, the Hulk, Thor, Ant-Man, Spidey (Steve Ditko take a bow), Doctor Doom, Loki, and most importantly the Toad Men. Among others. That’s a pretty good way to start the conversation. 3) There’s a clear cognitive dissonance between my love for Marvel origins and their importance, and the actual quality of many of these comics. Compared to what’s coming, Marvel year one is not the strongest year of comics. There’s a nostalgia and historical interest, but with the exception of Fantastic Four #5, I don’t really put a lot of these issues among the greats. That will start to turn around fast next year, but there’s a palpable (and understandable) sense of beginnings here. For the most part, Marvel Year One is a fascinating look at this brilliant comic universe testing the possibilities of the comic medium and the superhero genre. Just look at the weird, wild, wide array of powers we see from known quantities like Johnny Storm or Namor. 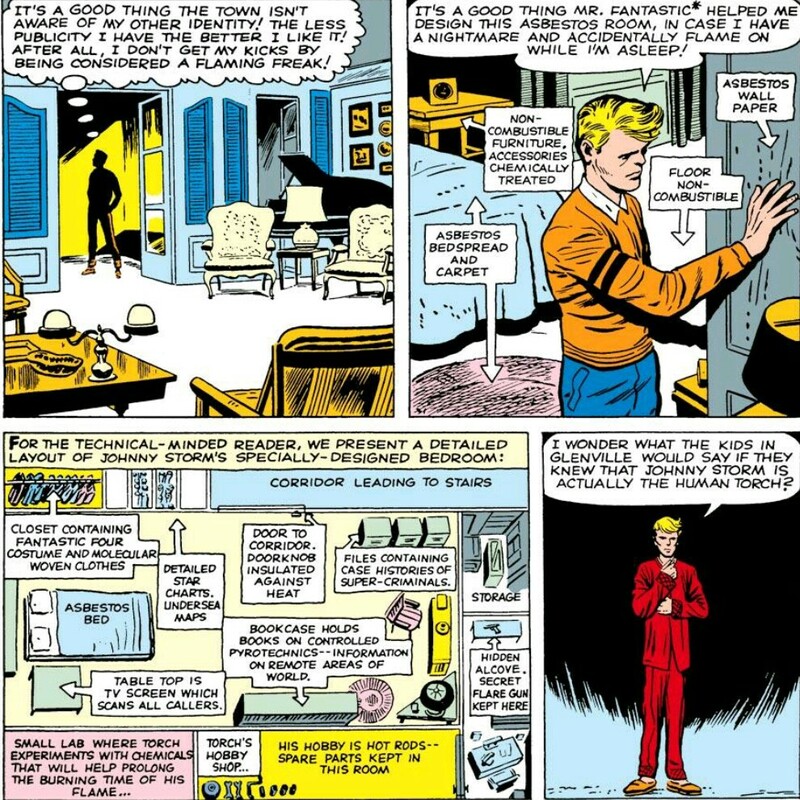 In Strange Tales, you have the Human Torch creating duplicate fire doubles of himself to tale criminals. In FF, you have Namor the Sub-Mariner straight up replicating the powers of all sea life. Not to mention, in Fantastic Four #4, the Thing walks into the belly of a fish with an atomic bomb strapped to his back. Like a modern Jonah and the Whale and literally zero understanding of atomic warfare. Don’t get me wrong, I love these comics. But get ready for the stories to really start to improve as Marvel moves out of their rookie year. 4) It’s incredible how much Jack Kirby’s art would improve. And remember it’s not like the King was new. Kirby bounced around a variety of comics and artwork from through the 40’s and 50’s, including the creation of Captain America (with Joe Simon) for Timely Comics. Kirby would, of course, come to define Marvel and frankly comics for years to come, but look at those early Fantastic Four issues and you see concepts without familiar refinement. The Things face is just mush. Torch is a fiery blur. It wouldn’t take the master of action long, but 1962 is the raw blueprint for the future. 5) For those of you wondering why we read Amazing Adult Fantasy #7 (the only comic on the list that doesn’t connect to the expanded Marvel Universe), it’s for two reasons: 1) I wanted to give you a sense of what comics were often like prior to the wave of superheroes following the Fantastic Four and 2) The old non super hero backup tales are loads of fun. 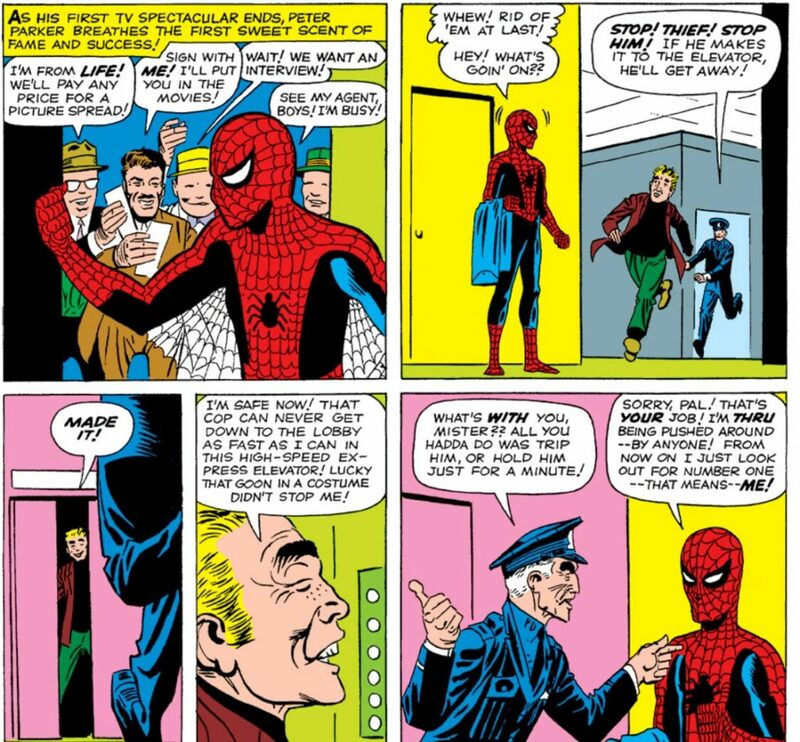 5 page twist endings like those in Amazing Adult Fantasy #15 are frequently a nostalgic blast, and feature some pretty great early Steve Ditko artwork. 6) People are all excited about Deadpool’s Meta Marvel, and his propensity to break the fourth wall, but Marvel’s meta tendencies are front and center in their first year. 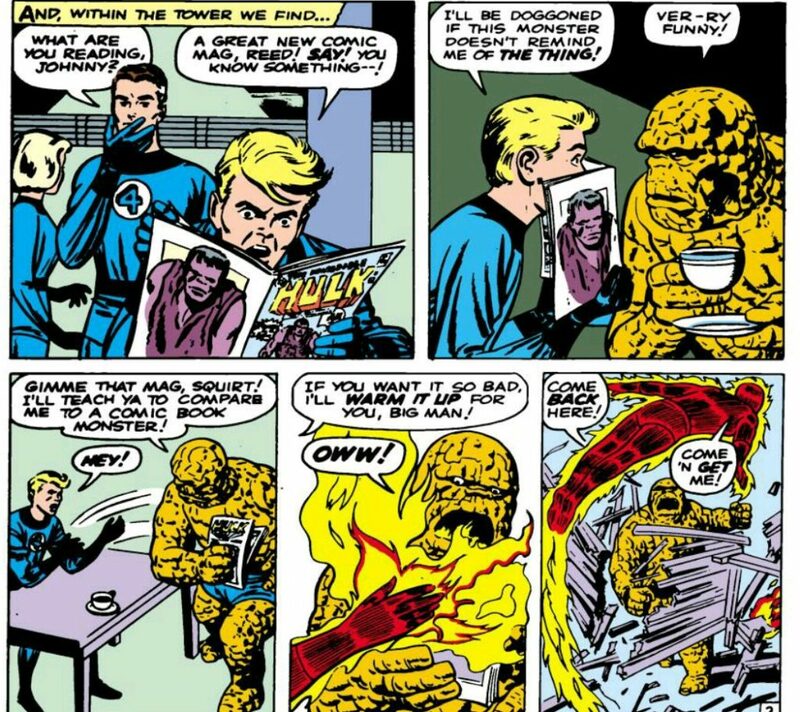 Just look at Fantastic Four #2, with Reed Richards showing the Skrulls copies of Journey Into Mystery and Strange Tales! There are all sorts of instances of Marvel comics showing up within Marvel comics (*kaboom*), but I’m still impressed just how early it really starts. There’s a playfulness to these early 60’s Marvel Comics that I love, and the Skrulls turning back from their first Secret Invasion because they’re scared of Strange Tales is a perfect example. 7) Marvel clearly wanted a high school hero even before Spidey solidified that concept forever, writing Johnny Storm as a secret high school hero in Strange Tales. It’s a savvy recognition of their core audience. As you can see in the letters, Stanly the manly and co. renamed Amazing Adult Fantasy to Amazing Fantasy because teens were writing in saying they felt awkward buying a magazine for adults (letter seen in Spidey’s first appearance in AF #15). Speaking of letters, what I wouldn’t give for more letters included in Marvel Unlimited! 8) We didn’t include it as part of the core reading list, but Incredible Hulk #3 basically prefaces Planet Hulk. I always thought the mega Hulk story of the 2000’s was a pure Greg Pak innovation, but there Stan and Jack are in 1962 shooting the Hulk into space as they only way to handle him! Hulk’s a particularly curious trivia piece, as Incredible Hulk launched as Marvel’s second solo superhero title, but then fizzled out after six issues. It’s the first Marvel era cancellation, although to be fair, Hulk was simply moved to Tales to Astonish, where he shared half a book with Namor the Sub-Mariner. In addition, Hulk is the only Marvel creation to actually start with a solo title and then move to an anthology collection. Everyone else starts in a book like Strange Tales or Astonishing Tales, and then progresses to the solo world (with Spidey’s jump from Amazing Fantasy #15 to Amazing Spider-Man in a single month marking the quickest launch time). 9) Larry Lieber doesn’t get a lot of hype as a foundational Marvel creative, but there he is in Strange Tales and Tales to Astonish, scripting the adventures of Ant-Man and the Human Torch. 10) For the record, asbestos is a heat-resistant fibrous silicate mineral that can be woven into fabrics, and is used in fire-resistant and insulating materials such as brake linings. Yes, I copied that from the dictionary, yes, that will continue to be used in approximately 100% of Human Torch related scenes. and no, I won’t be able to resist asbestos puns for even one more minute. Some brief highlights of my favorite write-in votes that I didn’t think to include in the options for MVH and MVV. The Gargoyle / Communism – A dirty red is the villain, and then the redeemed hero! Say what you will about Stan Lee the Manly, but there’s a recurring theme of heroism and heart in all people that is admirable. We actually had multiple readers vote for The Commies as villain of the year, and I gotta say, that isn’t going anywhere as we make our way through the 60’s. This is likely unsurprising to any student of history, but the Cold War patriotism of early 60’s America is rampant in Stanly the Manly’s dialogue. Invisible Woman – Props to the lone voter who nominated Susan Storm as the pick for hero of the year. The early 60’s aren’t great to Sue (believe me, we’ll talk about it), but she does have some shining moments. Perhaps none more so than saving the Fantastic Four from the clutches of Doctor Doom in Fantastic Four #5! The Thing – We had write-ins for Ben Grimm (The Thing) as both hero AND villain of the year! No character in Marvel Year One experiences as much of a character arc as The Thing. The Ever Lovin’ Blue-Eyed brawler isn’t so ever-lovin in these early issues, as he adjusts to life as… a thing! It’s hard to know how much Stan and Jack intended for his rage to quell as his innate heroism took over, but The Thing is mean-spirited, angry, and possibly suicidal (he straps an atomic bomb to his back) throughout the early part of 1962. 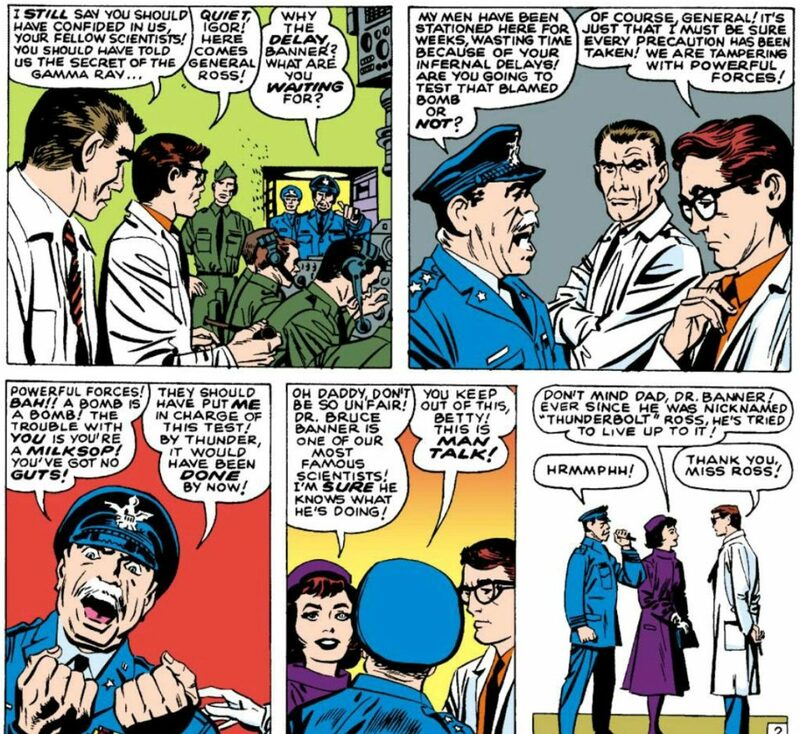 His transformation – which is most identifiable in Fantastic Four #8 with the introduction of Alicia Masters – is one of my favorite parts of Marvel in 1962. Marvel Year One is likely the easiest year of MVP voting we’ll see, as there are only four issues of Incredible Hulk, four issues of Thor in Journey Into Mystery, a handful of Ant-Man stories, and the origin of Spider-Man in Amazing Fantasy #15. Spidey did make a late comeback to beat out Thor as our runner-up to 1962 Hero of the Year (by one vote!). It’s hard to argue. Thor is undeniably solid out of the gate, laying the foundation for Asgard and Loki’s trickery, but Amazing Fantasy #15 is an iconic origin story. I was particularly amazed how much Spidey’s actual origin differed from my memory. He’s a real live TV star who passes on his responsibility to stop a burglar simply because he didn’t feel like it! While the origin of my favorite super-hero of all time (Spidey) is worth celebrating, and Thor made a surprising dark horse run at second place in our voting, they can’t hold a candle to a full year of Fantastic Four. The FF pulled in a majority 50% of the vote for 1962. The Fantastic Four’s first year is far from their best, and that origin is full of humorously dated moments, but it’s certainly an achievement. I’d also like to take this time to make one thing clear: you should try to read as many issues of Fantastic Four from this time period as humanly possible. These are all essential Marvel comics, and although we have to hone in on a few at a time, the first 100 issues of Fantastic Four should be in every Marvel fans back pocket. Villain of the year is a much trickier proposition than hero. We have the first appearances of Doctor Doom, Loki, and Egghead. Meanwhile, Sub-Mariner shows up in a typically villainous role 3 times from Fantastic Four #4 through issue #9 (unless, of course, you’re asking smitten Sue). To me, Doctor Doom, Loki, and Namor are the most captivating right out of the gate, so the question really becomes: who had a stronger first year? 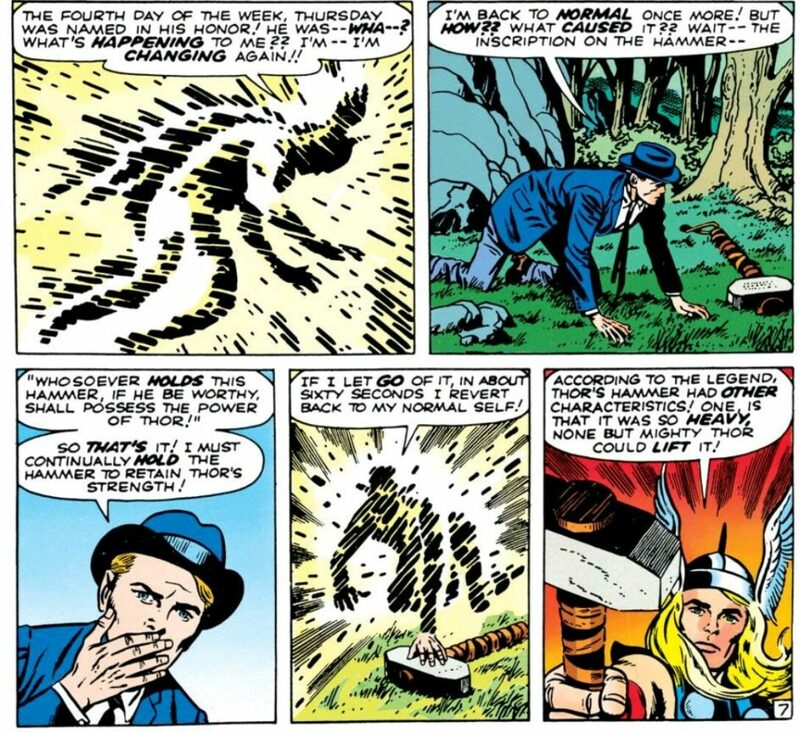 Loki’s attack on Thor in Journey Into Mystery #85 is fairly entertaining. The story begins with Loki imprisoned within a tree, able to control the plant just enough to shed a single leaf into the eye of Heimdall. Once free, Loki immediately travels to Earth to fight Thor, hardly his most cunning plan. Despite hypnotizing Thor and riding away on a literal flock of seagulls, Loki is bested by Thor in battle. The real battle, though, as you all made clear, is between Doom and Namor. I have to admit I did not see this coming, with the Sub-Mariner hauling in 39% of the vote, and Doctor Doom narrowly edging him with 44%. I have to agree with the people. In Fantastic Four #5, Doctor Doom captures and manipulates the Fantastic Four with ease. Not only that, but he forces Reed, Ben, and Johnny to travel back in time (on the time travel device he just up and built) to bring him the treasure of Blackbeard the pirate. Maybe it’s the residual 2015’s Secret Wars in me, but all hail Doom. Mister Fantastic was even more of a jerk than Professor X! Check out Fantastic Four #4, page 4 (that’s a lot of fours). What happened to that guy’s motorcycle when Mister ‘Fantastic’ lifted him off of it? And then he tells the guy “But if you don’t know where Johnny is then I’ve got no more time to waste on you”. Mister Sub-Optimal grabbed that guy, not the other way around! Bah! No wonder he became the big-bad of that alternate universe. Wait but it’s not ALL of the comics? I don’t think i get it. There are only these 11 issues for the entire 1961? just discovered this after registering for Marvel Unlimited. Very good! Not really sure why FF9 was picked for this though, seemed like a really irrelevant issue for the overall story, and it wasn’t a story that I particularly found that interesting. Wouldn’t a Human Torch Strange tales issue be more interesting? Just discovered this site, and dove head first into My Marvelous Year. Great reads so far! I realize this from the 1960s, but can they make Sue Storm sound any more helpless in these conversations? sheesh. Yeah, I’m pretty sure they can. And did. A bit late to the party, but I really wanted to get to know the Marvel universe for some time and I liked this site and your idea. I really was suprised how much I enjoyed amazing adult fantasy #7. Amazing adult Fantasy is great! Welcome aboard. FF is totally worth it too, enjoy the comics! I just wanted to say that what you have going on here is truly awesome.. Not just this website and content provided, but the environment.. Given where I live now as well as other circumstances including a new baby daughter on the way, I can’t just go and hang out anymore at the comic shop and talk about comics like I could when I was much younger. You’ve managed to capture an environment that I’ve missed for a longtime that allows me and others to share our interest and love for comics! I don’t know how many times or different ways that I can say thank you, it’s truly amazing! Thank you so much for your hard work and what you’ve given us!!! I’m very glad you enjoy, and look forward to seeing you around the site! Thanks for coming up with this, great idea! I’m starting a little bit behind everybody else but I hope to be caught up by the time you guys reach the end of the 70s. I actually bought a tablet and a marvel unlimited subscription after coming across your site. The reading club sounds like fun so I thought “what the he’ll, why not”. I haven’t really been a comic reader except a little bit as a kid in the early 90s, so I’m seeing all of these through fresh eyes. 1. Ben Grimm really, really got a raw deal. He didn’t even want to go on the mission to Mars and his fears were proven right. And what happens? He becomes the most cursed of all the FF, can’t even be out in public. I’d be really pissed off too. I’m pissed off for him at how non-chalantly the other FF treat his plight, especially Reed. 2. They seem to really expect The Hulk to be the next big thing, really haughty language throughout the first issue. That art style when the gamma bomb goes off and through Bruce really impressed me, I thought it looked really cool and I didn’t expect that from a comic of this era. 3. Some of the humor in these books is genuinely funny, I didn’t really expect that either. I laughed out loud at The Gargoyle’s comrades trying to pass the buck as to who would have to deliver a message to him. Totally agree that Big Ben Grimm gets treated like dirt early on. Reed calling him “Thing” moments after the change has always stood out to me as unthinkably callous, although that’s certainly reading into it with decades of hindsight. There are some very funny moments throughout the 60’s as well. Some of its corny, sure, but a lot is just outright laugh out loud good. First of all, I’d like to thank for all this. As one who got into DC comics early last year and was eager to enter the Marvel universe but didn’t know where to start and didn’t have the proper motivation. I have a question though, why is Hulk grey in those early issues? I thought he was he was always green! It was intended for him beeing grey from the beginning! But in some panels of the first issue(and i believe the second also), due to shadows, he had a more grey-green skin. Jack Kirby liked the greenish look more and he was supported by the readers and fans who also mentioned it in their letters to Marvel! All true! I must admit, it kind of confused me and my buddy when the second issue came out. For everyone playing along in the comments, remember that voting closes on 1962 at 6 p.m. CST TODAY, Thursday 1/7/16. You can vote here. I really enjoyed reading these early issues in Marvel’s history and seeing how different comics were back then. It’s interesting to see how these comics captured the concerns and sensibilities of America at that point of time, such as the preoccupation with commies and awe/wonder of radiation and scientific progress. It was funny how some of the panels were dedicated to outlining powers and capabilities, almost as if it were marketing a game or toy to children. I enjoyed this “campy-ness” and was also was surprised at the amount of imagination and storytelling that they could fit in the issues. Comics these days seem more content light in comparison (forget about having multiple chapters within 20 something pages–you have to get the next issue to complete the arc). There was a lot to like about this year in comics, like how many of the origins and characters were so fleshed out and continue to endure to today, but maybe I am using hindsight when I say that I wish that Invisible Girl is more useful (right now she seems underpowered and a damsel in distress) and that the different characters become more connected within the same universe (it was hilarious the Thing was compared to Johnny’s comic of Hulk, but I can’t wait to see them clash!). First appearance of the (my vote for Hero(es)) Fantastic Four and with that the start of the Marvel-Universe “Earth-616” as we know it today (kind of (damn you Secret Wars) + the first appearance of a recurring Villain “The Mole Man”, a pure classic! I was very surprised (not sure if positively) to find out that the condition for Banner to turn into Hulk was not him getting enraged or excited, but just the day/night cycle…and he is kind of greyish… (and as a side info I read somewhere that this was intended, but in some panels the Hulk looks greenish, and the fans (+ Jack Kirby) liked this. The things are really getting started now with the first (re-)appearances of Sub-Mariner and (my vote for villain) Dr. Doom. I think everyone of us knows them and knows what an impact and importance these 2 have in the Marvel Universe. If we would vote for the best story of the year (Dave? ;-)) this would be my pick by far! One of the best (and well known) Origin-Stories of all the Marvel-Heroes! Spider-Man…you got to love him right from the start! He is in fact like any other teenager at that time, driven by his emotions, inexperience, faults! We get to know a simple normal average boy who will develop so much over the years to come! The first appearance of Ant-Man but not of Henry Pym, I myself did not know, Ant-Man was “born” so early into the Marvel Universe. Also another Multi-Mini-Comic Magazine starting to change. The FF are bankrupt and Sub-Mariner sees a chance to finish them for good, I really liked this story except I knew right from the beginning that the film studio was part of Sub-Mariners Plan! Love the thoughts, thanks Sebastian! Don’t worry we won’t be hitting Strange Tales too hard… just every appearance of Paste Pot Pete (just kidding!). I laughed way to hard at the comment about Paste-Pot-Pete XD! But the real reason I replied is because – again, no pun intended – is I have a good friend who lives in Leipzig. Small world, right? Yeah I meant the costume -> for me Ant-Man (the costumed superhero), i know Hank (Henry Pym) first appeared in Issue #27 of TtA! Now, that is what i call a coincidence :-)! Yeah this world is so small :)! Not sure about issue of the year – but my fave of the year may be that first ish of Incredible Hulk. Possibly because of the aforementioned nostalgia of my first Marvel. And in spite of his somewhat vampirish (is that a word?) changing. And color. If ANY character was a work in progress in his first book, it’s gotta be ol’ greensk…oh, wait! So I will be clear, we are discussing the books here or in the forums? Good question. Plan to discuss here, in the comments. If it becomes unruly we can move to the forums, but this is a bit faster/easier for the foreseeable future. Some unexpected real-life crises are causing me to fall behind quickly. But my favorite era of Marvel is 1965-1976 anyway, so hopefully by next month I’ll be caught up and posting a lot more. That’s too bad, I look forward to your thoughts and wish you well! Does anyone have any insight as to why The Incredible Hulk was canceled so soon? Out of these initial silver age stories I think it’s one of the best. Bruce Banner has the least control over his powers yet he still makes a huge effort to do good with them, the enemies are weird and interesting and there’s a great cast of supporting characters. Also, separate question entirely, but why hasn’t there been a Rick Jones in any of the MCU films? He’s such a good sidekick! I love this idea and am thoroughly enjoying it so far. I’m looking forward to the years I’m not familiar with — mid-60’s to late 80’s and late 90’s to 2014. I really love 60’s era comics for some reason. I think it’s the sense of excitement that comes through, and there’s also of course an incredible amount of imagination going on here, with some of the most iconic origin stories in comic book history and some really weird concepts (Ant-Man in particular). I had read most of these before, but the Amazing Adult Fantasy was new, and I’d read the Ant-Man part of Tales to Astonish but not the rest of the stories. I had to vote Spider-Man as Hero of the Year just because I find it astonishing how fully realized he is out of the gate (there’s a reason that his origin story is one of the most well known in all of comics, probably third only to Batman and Superman), and I also feel like he really goes through a full arc of exploring what he can do with his powers and discovering that he should use them for good after initially using them for personal gain. He may not be the most heroic of all of the heroes in 1962, but he’s the one who I think truly understands WHY he needs to be a hero with the gifts he’s been given. Villain of the Year is, no question for me, Doctor Doom. He’s one of my absolute favorite villains in all of comics, as I think he’s the perfect blend of super campy but legitimately tragic that makes him very compelling as a comic book character. He also has great motivations for what he does (which aren’t really explored at this point). Finally, I’m always impressed at how perfect of a foil he is for Reed (and clearly written to be so) but how well he ends up fitting into the whole Marvel universe and how well he plays off of other characters. FF: Gotta be the heroes of the year based on quantity alone. Nobody else showed up early enough. Except maybe Hank Pym. He debuted in, what, 1959? FF #1: Plus, the one that started the whole Marvel landslide! FF #2: Sophomore jinx. Too many logic fails. Such as, why would the FF allow themselves to be arrested only to immediately break out again? FF #4: Intro of a GA Hero in a plausible way. Almost. Kind of a coincidence since CA also re-debuted in a #4. FF #5: Intro of the greatest villain evah! Also got my vote as the Villain of the year. FF #9: Always felt more like a novelty issue to me. I would have gone with the previous issue – intro of the Puppet Master and Alicia – Thing’s great love! Side note: Sub-Mariner shows some strange powers that, IIRC, rarely show up again. Though they may have shown up in the Golden Age. Amazing Adult Fantasy #7: Not sure why this was included – maybe for the introduction of J Jonah Jameson (under the alias Sidney Blake). JIM #83, 85: Ah yes. Thor. Not really an auspicious debut. And not really one story, either. I suspect these two got lumped together as the origins of both Thor and Loki. TTA #35: Not an intro – that was in TTA #27, which was cover-dated Jan ’62, so coulda been included here. Antman would go on to much better adventures. This wasn’t one of them possibly because of the length it had to adhere to. The sub-mariners enhanced power set is one of my favorite wrinkles from the time period. We see the same thing with human torch. I’m curious how stan and jack walk it back, I really don’t remember. Why would Johnny burn his way out of the car? It’s a nice car, just use the door. Haha yes, I made a similar observation. Plus… Johnny loves cars! It’d be like me burning a pile of comics just because I had the ability. Oh well, if we held the Fantastic Four to reasonable standards of avoiding wanton destruction, we wouldn’t get things like The Thing walking into a giant wish with an atomic bomb strapped to his back. I skipped the anthology book, as I feel I have read enough of Marvel’s early horror/sci-fi stories already, including Tales to Astonish #1. These issues are all pretty solid introductions to the characters and ideas of 1960’s Marvel. The best two stories are Amazing Fantasy #15 and Fantastic Four #2. They pack a lot of story ideas and great moments into every page. I voted for the FF as best hero, as they had the most good issues of the year. Dr. Doom gets a lot better later on, but I voted him for best villain solely because of his time machine. I was completely thrilled to discover that Doctor Doom’s first appearance includes the time platform. Not that I’m biased on voting, but he’s the best. I lean towards FF #5 as my personal favorite, but you raise a great point: We should probably vote on issue of the year too! If there’s enough interest I think I’ll add that for 1963. Adding issue or story of the year to the voting is probably a good idea. I think I’d have to pick the Spider-Man origin as the best because of how fully it develops the story and motivations of the character who went on to become Marvel’s best hero. In terms of my personal favorite though, I really liked reading Thor’s origin because he’s my favorite of the major heroes introduced this year, so I caught on to more of the things that have been referenced in contemporary Thor stories I’ve enjoyed (and Planet Hulk!). Glad I didn’t talk myself out of signing up for this. Even though some elements of these comics are really campy by today’s standards, they still deal with the serious human problems that make stories compelling. And it’s interesting how fully these stories developed the mythos of these classic characters in just a few pages. The writers (mostly Stan Lee) may not have known if these characters would take off, but they were fully prepared for if they did so. The mythos bit is a great point, and pretty fascinating to look back at. The creators’ ability to knock out fully formed origins in a few pages (or in Doctor Doom’s case, 6 panels!) is remarkable. Spider-Man’s debut is the most incredible to me. I had completely forgotten that he’s basically tempted to become Elvis/The Beatles. He’s on TV and not just wrestling. Nonetheless, all the elements of what make Peter Parker tick are firmly in place. After reading Fantastic Four #1, I feel like I owe the 2005 movie an apology. I found it hard to believe that I was supposed to root for heroes that, in their first heroic effort, caused a lot of collateral damage in doing so. Then I read this and see the Human Torch take out a couple of jets, and The Thing taking out a car and damaging a good chunk of the street. That’s…an oddly faithful choice made by Tim Story. I also enjoyed what I read of Amazing Adult Fantasy, though they should probably be labeled properly as being for older children or young adults. Still have quite a few stories to go, the holiday kept me from updating my tablet with the comics to read so I’m going to have to do some catching up to vote in time. Superheroes have never been particularly kind to their surroundings. Man of Steel took a lot of flak too, but there Supes is on the cover of Action Comics #1 straight up hurling somebody’s car (presumably not his own). I am impressed by the hyperbole in these old books, as well as the sense of a unifying societal fear. It feels like the Cold War ended a long time ago, but these books are a reminder of how real it was just after mid-century. I was going to choose a hero based on reputation or “coolness,” but I realized that the character who made the ultimate heroic sacrifice was The Gargoyle (who also regained the humanity that Ben and Banner are still pursuing today), so I wrote him in for hero and acknowledged “The Commies” as the villain of the year. Geez, the Iron Curtain and its denizens were as ever-present in these books as mentions of “Hell’s Kitchen” in the Netflix Daredevil show. I started a drinking game for every time someone mentioned “commies” or the “iron curtain,” but I passed out halfway through the reading list. Haha yes, don’t try the same drinking game for 1963 or you might not make it to our next week of reading! The Commies will remain ever present as a force to reckon with, but it’s notable how sympathetic and humanizing these comics treat those from Communist nations. The Gargoyle may well be the prime example. These old comics crack me up! Everyone is “the greatest scientist known to man” or “the most brilliant engineer the world has ever seen”. The lucky conveniences that always pop up in he last page or two to help solve the problem are great. It’s so different than the comics of today. Great list, lots of good intros for a lot of beloved Marvel characters. I love that you say “different.” Everyone wants to call old comic books “better” or “worse” than what we have now and it’s not even a competition! I’m loving the comic book world we have now that was born out of the fantastic, goofy, campy, super fun comics of this old age. Glad you’re enjoying so far! I have been impressed by the “lucky conveniences” you mention, in that they occur so late in the story. I’ve flipped to the final page of several issues now thinking, “Wait, how do the Fantastic Four get out of this jam in one page?” The story per page quotient of these original issues is through the roof! I also found the parameters for Hulk and Thor interesting (Hulk at night, Banner by day, Blake has to actually touch hammer to stay Thor). How long did those last before they were dropped? The hammer bit lasts for a lonngggggg time. I’m not sure when exactly it becomes more flexible (one of the many things I’m looking forward to as we progress), but that 60 second hammer parameter is abundant. Such an awesome idea! I would never have looked up something like AAF #7 on my own, but very glad you pointed me in that direction. I had also only read FF #1 and #2 for fun, and totally missed the into of Doom – front runner for villian of the year for me so far. Doom’s intro is great. He’s such a fully formed villain right out of the gate, and they knock out his origin story in six panels! I’ll definitely talk about it some more when I recap the winners, but Fantastic Four #5 is likely my favorite issue of the year. This is a great start. I was also happy to dig out my copy of Origins of Marvel Comics to read some of these. Oh, and do I vote through these comments? There was a link in the email for the vote! I’m excited to see the results! Here’s the link to vote in case you missed it! I voted for the Thing for Villain of the Year because he really acts like a jerk a lot. Throwing cars, fighting with Reed and Johnny, leaving the team multiple times. Also I didn’t notice any Marvel characters in Amazing Adult Fantasy #7. Just for fun? I really love that vote for villain of the year. I didn’t think of that, but that’s very true: Ben’s kind of a jerk! Probably doesn’t help that Reed, Sue and Johnny immediately (and constantly) refer to him as “Thing,” rather than Big Ben Grimm. I wonder how carefully orchestrated his bad attitude was. In retrospect it makes a lot of sense. Most people would be pissed off and lashing out after a transformation like that. It’s fairly remarkable how his attitude softens once Alisha comes into the picture later in the year (FF #8). 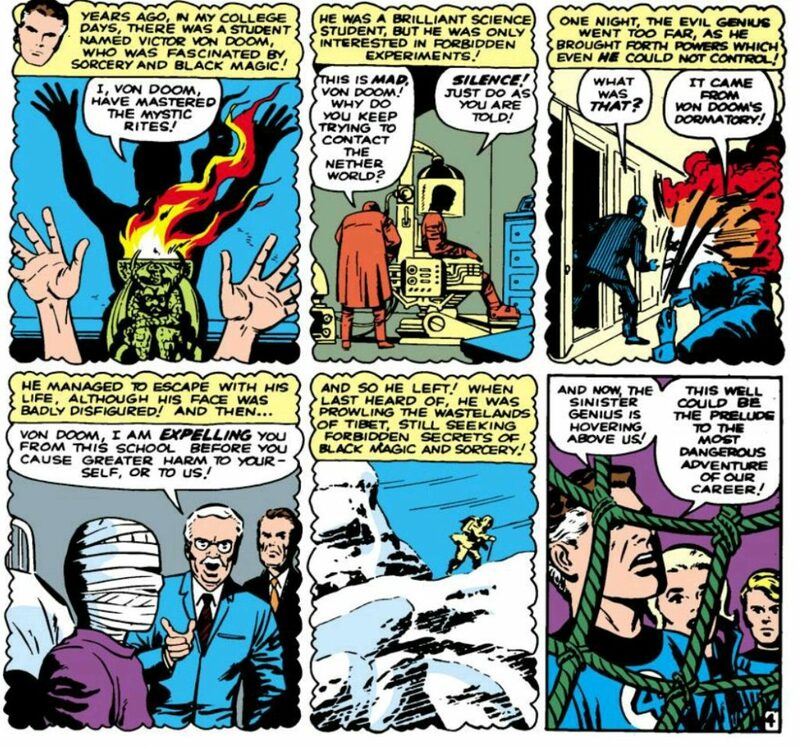 As for Amazing Adult Fantasy, it’s largely to provide some context into what Marvel comics looked like at the end of 1961, as Fantastic Four was debuting. That, plus there are some really fun stories with early Steve Ditko art. You know, I was thinking of giving my vote for HERO of the year to Ben Grimm/Thing for a similar reason. Despite his constant (justified) anger and as you mentioned the team’s antagonizing use of “the thing” as his title he still cooperates on saving the day and beating up the bad guy. He maybe has the worst 1962 of any of the group of Marvel characters (except poor Spider-Man) and yet he still follows through on being a hero. That being said, I love the angle of him being a villain, good stuff here.